Submitted by kurtvm on Sat, 07/26/2008 - 15:25. Speaker comfirmation mails for the UKOUG 2008 are dripping in. I see that Marco Gralike made the cut. it looks like a lot of oakies will be there including my US partner Daniel Fink from Optimal DBA. While we're on the subject - I will also be presenting at the Oracle Technology Days on september the 9th in Brussels. For people in the Benelux, I would like to mention that Doug Burns will be giving his Oracle 10g performance analysis course in october at the Oracle university in Brussels. Doug is a very passionate speaker and tutor and if you're in need of a tuning course and you are in the benelux area, then don't miss out on it ! And there's more - my south african partner, and dear friend Kugendran Naidoo from NRGC will be presenting a backup & recovery paper based on the 'DUDE where's my data?' presentation at the South African Oracle User Group convention (SAOUG) in Sun City in october. I was actually thinking about joining him but now with UKOUG in sight, he'll be on his own. With all this said - I won't be going to OOW2008. I don't mind really (you'll know why reading my next blog post). some wine tasting. We ended up at Francis Ford Coppola's winery. 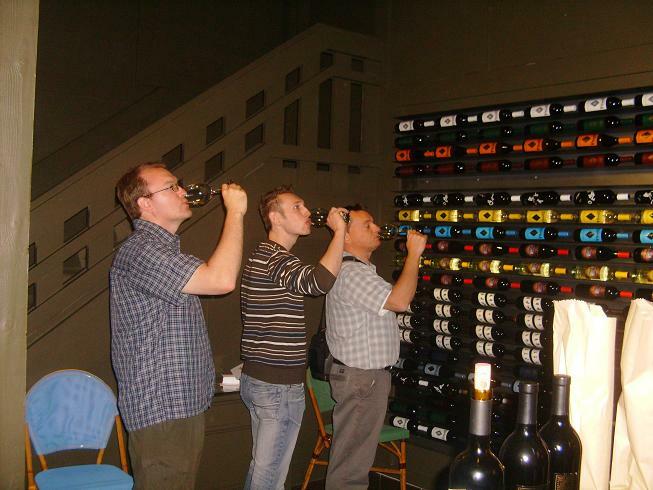 Here's a picture of me and my collega's at the tasting - one of the guys ended up buying 18 bottles of wine... which he eventually had to check in as luggage on the way back, because for some reason no shipping company would ship the wine to belgium. The fact that we look like the Daltons is completely unintentional !